Published: Feb. 6, 2018 at 12:39 p.m. Updated: Feb. 7, 2019 at 04:56 p.m. The Seahawks picked up Baldwin as an undrafted free agent after he posted a breakout senior season for the Cardinal in 2010. The club liked him enough to sign him to three contracts, the last of which netted him more than $24 million in guaranteed money. 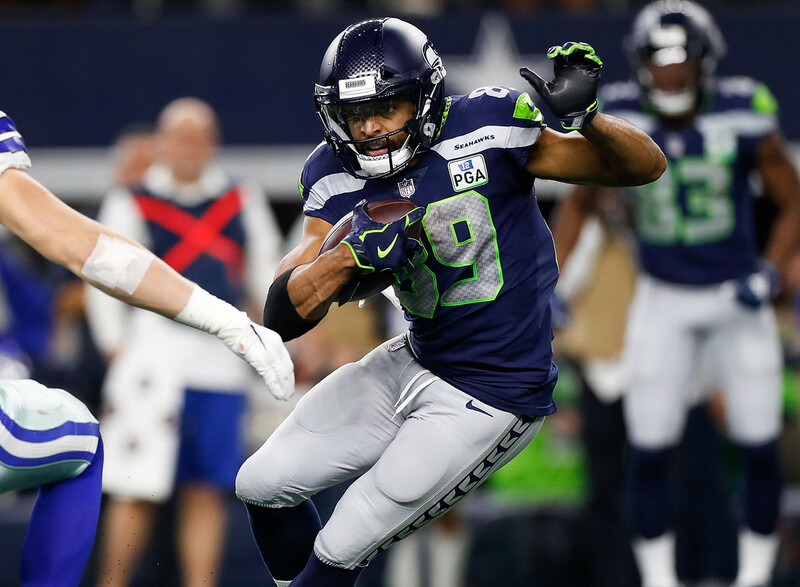 He's now spent eight seasons in Seattle and has averaged more than 100 receptions over the last five seasons. A game-clinching interception to prevent a touchdown made Butler the hero of Super Bowl XLIX. After four seasons and one Pro Bowl nod in New England, he moved on to Tennessee last year, where he made a career-high 69 tackles. Butler has made 11 career interceptions. We're at peak-Edelman at this point, after the Patriots receiver took home Super Bowl MVP honors in Sunday's win over the Los Angeles Rams. He caught 10 passes for 141 yards and passed Michael Irvin for second all-time in postseason receiving yards (1,412). The former college quarterback found the perfect home in New England, where he was made into a first-down machine as a slot receiver. Gates continued his seemingly endless NFL career with another 28 catches last year, though that was his lowest total since his rookie year in 2003. The former college basketball player has been named to eight Pro Bowls and was named to the NFL's 2000s All-Decade team. He's now logged 11,841 career receiving yards and figures to be an easy eventual choice for the Pro Football Hall of Fame. Despite playing in only 12 games, Harris made his fourth Pro Bowl last year, in his eighth season in Denver. He was a regular starter beginning with his second NFL season in 2012, and after four years, the club awarded him a five-year contract extension in 2014. With 19 career interceptions, he's been a gem of an addition for the Broncos. Hill has made the Pro Bowl in each of his first three NFL seasons, proving to be a versatile threat in Kansas City primarily as a receiver, but as a rusher and punt returner as well. The emergence of Patrick Mahomes at quarterback has only enhanced his production, as he set career highs last year in Mahomes' first season as a starter in catches (87), receiving yards (1,479) and TDs (12). An arrest for domestic violence in college resulted in a transfer from Oklahoma State to UWA and damaged his NFL draft standing. Smith was a two-year starter at USC, and the Seattle Seahawks took a flier on him with their last pick of the 2011 draft, a compensatory pick at No. 242 overall. After missing the 2017 season due to injury, he made five starts for the San Francisco 49ers last year. His career peak to date came in Oakland, where he posted back-to-back 100-tackle seasons in 2015 and 2016. Thielen made 198 catches at the college level but had to make the Vikings roster as an undrafted free agent in 2014. He has now been named to back-to-back Pro Bowls and just set a career high for single-season yardage (1,373) in his fifth pro season. Villanueva made failed attempts to catch on in the NFL with the Cincinnati Bengals and Chicago Bears before being signed by the Philadelphia Eagles. He was waived before ever playing a game in Philly, but the Steelers picked him up and have seen him develop into a two-time Pro Bowler. He hasn't missed a regular-season start in Pittsburgh over the last three seasons. There wasn't much buzz about Lindsay last spring, despite back-to-back spectacular seasons to close his Colorado career. He competed at the East-West Shrine Game but went unselected in the draft. The former Buffaloes star made the Pro Bowl as a rookie for the Broncos, rushing for 1,037 yards with a whopping average of 5.4 yards per carry.